Get the latest news on new projects of the Garden. Over the river and through the woods you trekked to find the perfect, most lush Christmas tree (okay, maybe you drove to the nearest retail lot and pointed at that one). Now that you picked your evergreen, how do you make it last through the holidays (and possibly even longer)? Keeping your tree fresh isn’t hard—most can live up to a month—as long as you follow some simple rules of evergreen thumb. Get it? Horticulturist Tom Weaver explains how to get the most life out of your tree in a few easy steps. If you’re shopping for pre-cut live trees at a nursery or retail lot, never buy a bagged tree, says Weaver. It’s harder to know whether the tree is fresh if it’s wrapped in netting. The best way to tell which pre-cut tree will last longest is to do the “shake test.” Grab a tree by its trunk and give it a little jostle. If more than handful of the tree’s needles fall off, you may want to keep looking. Also, make sure the needles are firm, flexible, and dark green—not dry, brown, and brittle. Firs keep their needles longest, but there are many kinds of evergreens to choose from. If you purchase a tree at a location less than 20 minutes from your home, ask for the tree stump to be cut ½ to 1 inch while at the retailer. If you’re commuting more than 20 minutes with tree in tow, make the cut yourself at home. When a tree sits in a lot, its stump creates a callus to prevent it from losing water and sap. A fresh cut allows the tree to absorb water more easily. Make sure the cut is perpendicular, not at an angle or pointed. As soon as you get your tree home, plunge it in a bucket of room-temperature water until you’re ready to put it in a tree stand. Make sure the tree stand reservoir can hold enough water for the size of tree you picked—Christmas trees generally drink a quart of water a day per 1 inch diameter of the tree’s stem. Most drink up to a gallon a day. Don’t let the water dish run dry! Though you’ll likely want to snuggle up next to the fire to gaze lovingly at your tree, the tree doesn’t share this wish. Position it far away from any heat source (fireplaces, furnaces, radiators, and heating vents), because heat speeds up the drying out process. Not only will that mean your tree will die sooner, but a dry tree is also a big fire hazard. Show your tree some love by keeping it in a cool place, and you’ll enjoy its piney scent through the New Year. Now that the holidays are bearing down, we’ve put together some gift ideas for the nature lovers and others on your list, including the blooms-loving home mixologist (three words: cherry blossom elixir). Bring your shopping list (or personal wish list; we won’t tell) to the cozy Chicago Botanic Garden Shop, where our offerings include handmade, inspired-by-nature gifts that you won’t find anywhere else in the area. Proceeds from your purchase help support the Garden’s mission. Get your holiday shopping done early and then treat yourself to a walk at the Garden. Parking fees apply; members park for free (and get a 10 percent discount at the Garden Shop). Or shop online anytime. These floral elixirs will transform champagne, spirits, and soda water into celebratory holiday cocktails and mocktails. Besides the cherry blossom elixir, other flavors include hibiscus and violet. Each elixir is all natural and handcrafted from real flowers. The new Chicago Botanic Garden holiday ornament features the 48-bell Theodore C. Butz Memorial Carillon, a lovely reminder of bells on a summer evening. This ornament, which has a silver palladium finish, also highlights the Garden’s elegant willow trees. This hand-painted collection from Tag is perfect for the host or hostess who appreciates the splash of color that a cardinal brings on a winter’s day. The Cardinal Collection includes mugs, a dessert dish, and platter, and is dishwasher and microwave safe. Nature lovers can celebrate the ephemeral grace of a gingko leaf and other reminders of the natural world with this handcrafted jewelry. Nature’s Creations uses natural items or impressions from nature to make each piece, which is finished with bronze and other patinas. Each handmade stud in this gemstone earrings set is handpicked, so no two are alike. Instead, the JaxKelly studs complement each other as sisters, not twins—metaphor, anyone? The earrings are gold vermeil over sterling silver. 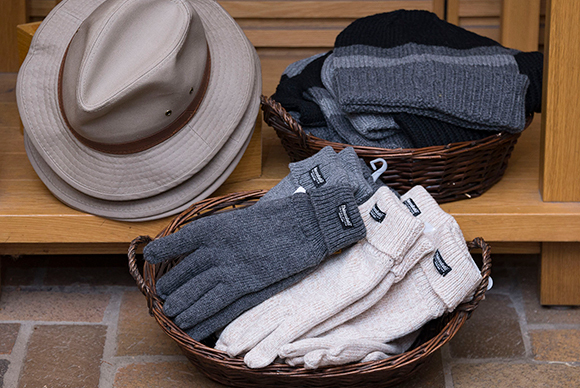 For the man who isn’t scared by winter weather, consider these classic accessories from Dorfman Pacific Co. The warm 3M thinsulate gloves and fleece-lined hats will come in handy on walks in bone-chilling weather. Photography fans and garden lovers will be reminded of the beauty of the seasons with the Chicago Botanic Garden’s 2018 desktop calendar. Featured scenes include the vibrant colors of spring-blooming tulips and the elegance of the Malott Japanese Garden. Who doesn’t love a vintage train? We do at the Garden, where we celebrate the holidays with the annual Wonderland Express train exhibition. This two-piece train ornament is crafted and hand painted in Poland. Anyone who is interested in the natural world and how we study it will enjoy Lab Girl, the memoir by Fulbright Award-winning geobiologist Hope Jahren. Looking for a boost to your cocktail party chitchat? Enjoy tidbits about the plants that led to the creation of the world’s great drinks in the New York Times bestseller The Drunken Botanist. Prices vary. Browse books available online. The bright pomegranates on this sturdy servingware will lend a festive flair to any gathering. The collection by Tag includes individual bowls and a serving bowl; all are dishwasher and microwave safe. Davin and Susan Butterfield are the artists behind this unique, small-studio editions of fine handmade pottery in stoneware. The collection features tableware and pottery, with nature-inspired patterns. Butterfield pottery is food safe, and microwave and dishwasher safe. 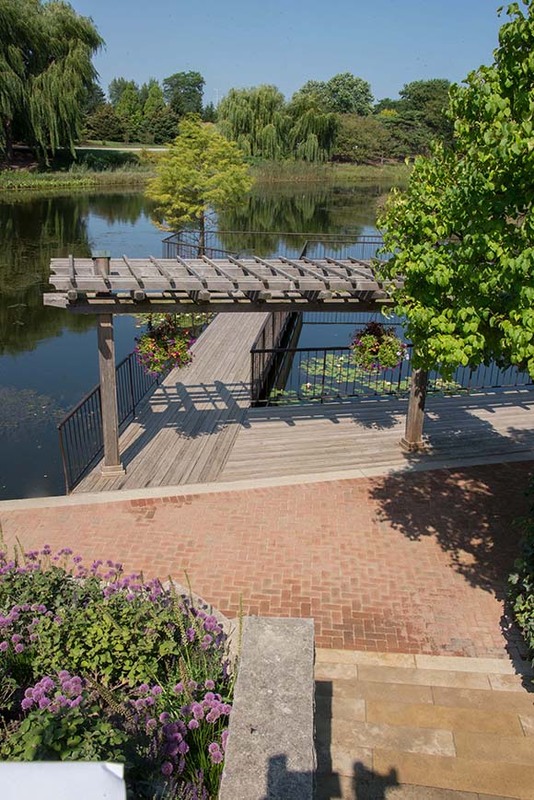 Inspire and delight your loved ones with year-round access to the Chicago Botanic Garden. Membership includes free parking 365 days of the year, and special discounts on classes and events, the Garden Shop’s merchandise, and more. Your gift membership is fully tax-deductible and directly supports the Garden’s mission. It might be fall, but the last weeks of September felt like summer, and that’s going to change how long trees will show off their seasonal colors. On the official first day of fall, temperatures in the Chicago area reached well into the 90s. Heat and the recent lack of rainfall means trees are going into survival mode to conserve water, which means that mid-October’s typical fall colors will be affected. Deciduous trees, explains Boyce Tankersley, director of living plant documentation, respond to environmental conditions when preparing to go dormant for the winter. Just like animals that hibernate, trees slow their processes down in order to conserve energy. 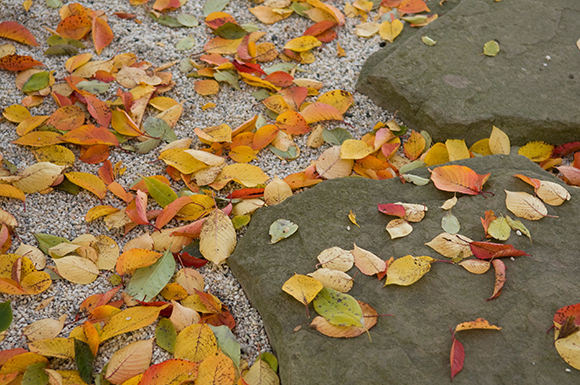 What we can see of this process can be beautiful: leaves change from green to vibrant reds, oranges and yellows. Then trees will drop their leaves and wait out the winter. In a regular year, trees aren’t in a rush to go dormant. The process that we see takes several weeks. The production of chlorophyll, which produces the green color in leaves, fades away, unmasking the beautiful colors we associate with autumn. As the season progresses, the leaves will eventually drop. In Chicago, our trees usually reach peak color in the first two weeks of October, and aren’t usually bare until late October or early November. But this isn’t a regular year. The heat we’ve been feeling lately is a factor. Expect color, but this year’s display will be shorter than usual. “The higher the temperature, the faster the processes go,” Tankersley said. And this month’s drought is why we’re also seeing leaves dropping only a few days into fall. Local rain gauges have been virtually dry, with less than 2 inches recorded in the month of September. “Trees don’t have minds, but they do respond to environmental clues. If there’s been little rain, they will drop their leaves early in order to conserve water and get through the rest of fall and winter,” he said. If you’re a fan of getting family portraits done with a backdrop of colorful foliage, Tankersley suggests getting those done sooner rather than later. The Supreme Court has been asked to opine on many critical issues of its time. These cases have had profound impacts on our society and even the progression of democracy. But perhaps the most important Supreme Court case of all time—at least if you are a hard-core plant geek—was Nix v. Hedden, 1893, in which the Court ruled that the tomato is, for the purposes of taxation, a vegetable. In the spring of 1886, the Nix family made their living importing tomatoes into New York City from the West Indies. Based on the Tariff Act of 1883, the New York Port tax collector assessed a duty on these imported tomatoes. The Tariff Act required a 10 percent duty on “vegetables in their natural state…” But, the Nix family contended, a tomato is a fruit, botanically speaking, and should not be taxed as a vegetable. The New York tax collector was unmoved by this argument and forced the family to pay the tax, though he did record that the tax was paid under protest. People were just as reluctant to pay taxes in 1886 as they are today, and as any good botanist of the nineteenth or twenty-first centuries would tell you, the tomato is indeed a fruit. Its tissues derive from the reproductive organs of the plant (and contain seeds), making it a textbook fruit. It’s not even botanically confusing like the oddball strawberry, which is technically a swollen receptacle that holds fruits (the little black achenes on the strawberry’s surface). A tomato is about as clearly a fruit as there is, botanically speaking. Yet, in common language, we tend to think of fruits as sweet and vegetables as savory. Or perhaps more basically, fruits are for dessert and vegetable go with the main course. When the tax assessor for the New York Harbor used the common language meaning of tomato as the rationale to levy a tax, in opposition to the botanical definition used by the Nix family, I doubt he knew he was opening a legal can of worms that would end up in the Supreme Court. The Nix family sued the tax collector. The case was heard by the Circuit Court of the Southern District of New York. The case primarily consisted of entering into testimony the dictionary definitions of fruit and vegetable. The court sided with the tax collector, and the Nixes appealed. Somewhat amazingly, the Supreme Court agreed to hear the case, and registered judgement on May 10, 1893. The Supreme Court unequivocally stated in Robertson v. Salomon and then reaffirmed in Nix v. Hedden that a technical definition should not necessarily stand in the way of an ordinary or common meaning. According to the high court, tomatoes and white beans are not fruit and seeds, respectively. They can, and should, be taxed as vegetables. These cases are important to legal history in delineating the differences between technical and common usages of words under legal dispute. But what should a botanist learn from this legal tomato obscurity? Principally, science and the law are quite different systems. You may conflate them at your own peril. Scientific logic is not always compatible or supported by legal doctrine. Under the law, up can be down, black can be white, and tomatoes aren’t fruits. And above all, it’s very hard to avoid paying taxes. Guest blogger Ari Novy, Ph.D., is chief scientist at the Leichtag Foundation in Encinitas, California, and a research collaborator at the National Museum of Natural History in Washington, D.C. He’s interested in pretty much everything about plants, including obscure legal minutiae. Last month, torrential rains fell over much of our region, particularly in Lake and McHenry counties, as well as southeastern Wisconsin. 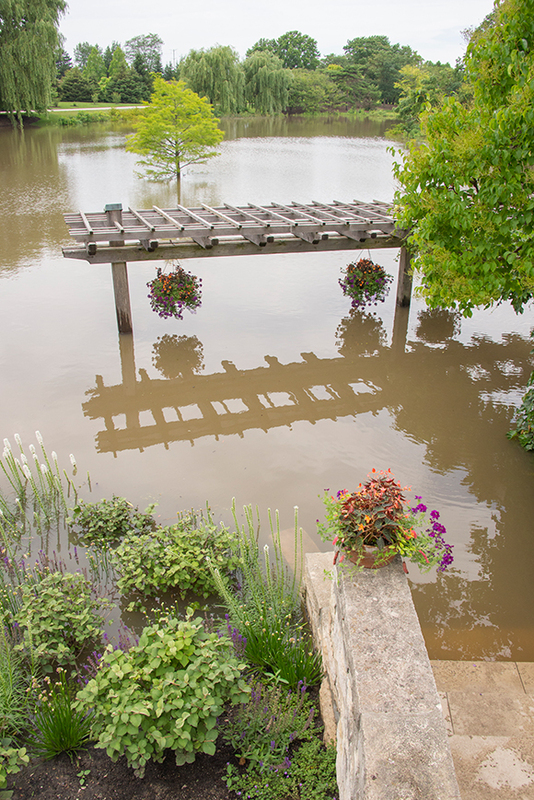 Here at the Chicago Botanic Garden, high water levels in the Skokie River forced us to close on July 13 and 14—the first time in the Garden’s history that we’ve been closed to visitors for two consecutive days. So what exactly happened that required us to close? And how did the flooding affect our plants? The Garden is situated in the “watershed” of the Skokie River that extends north to Waukegan. A portion of the rain that falls in this upstream, 20-square-mile watershed eventually finds its way to the Skokie River. 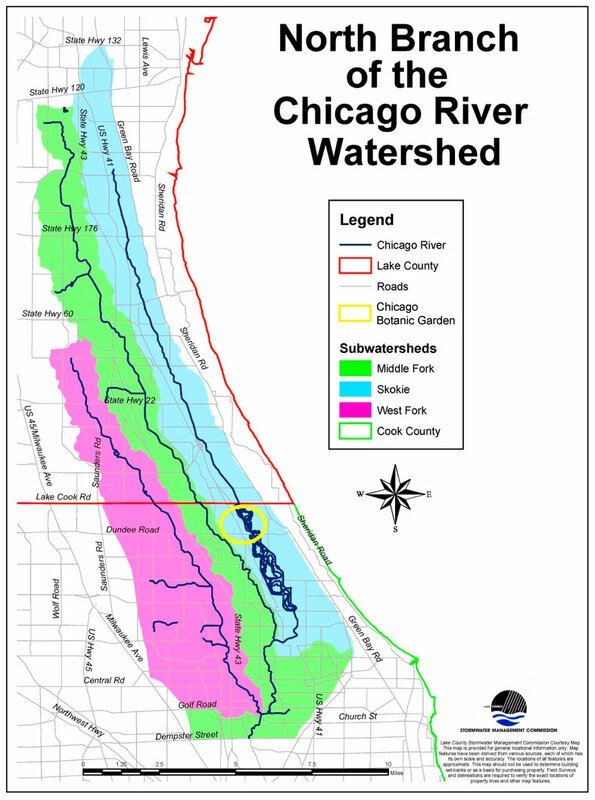 During the early morning of July 12, between 3 and 5 inches of rain fell in that watershed area over a matter of hours, resulting in a rapid rise in the Skokie River as it flows around the west side of the Garden. In fact, the rainfall was so severe that portions of the village of Lake Bluff (located in our watershed) experienced rainfall intensity and quantity that is predicted to occur with a frequency of only about once every 140 years. Prior to the Garden’s creation, the Skokie River meandered through the middle of our property. 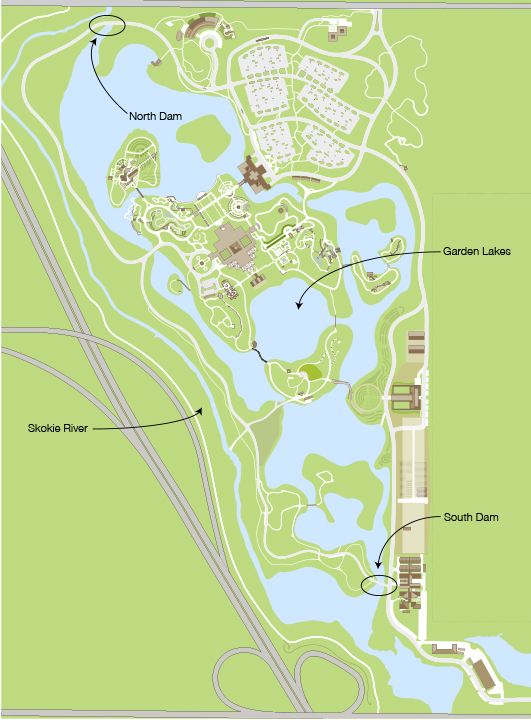 As the Garden began to take shape in the late 1960s, heavy construction equipment excavated our lakes (some exceed 16 feet deep), and those soils were then used to create the islands and display gardens that you enjoy today. At the same time, the Skokie River was moved into a defined channel on the west side of our property near the highway, and two dams were installed at the north and south ends of our lake system to isolate it from the river except during high flows (see graphic). These dams were installed to help protect communities downstream of the Garden from flooding: if levels in the Skokie River rise high enough, river water flows over the north dam into the Garden lakes and we’ll temporarily store over 100 million gallons of floodwater. After the river’s flood peak has passed, we slowly release that water out of the Garden’s lakes and back into the Skokie River. Last month’s flooding at the Garden was dramatic. Our lake levels rose more than 5.5 feet above normal and were on par with the highest we’ve ever encountered. 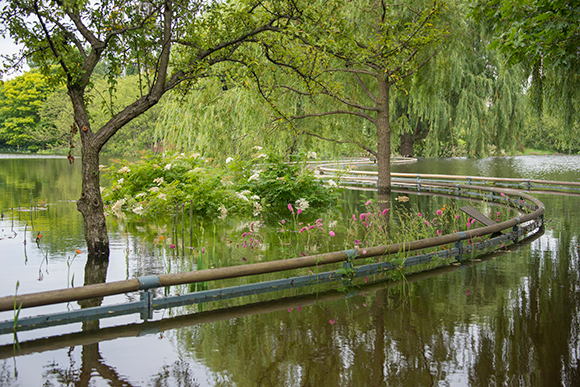 At one point early in the flood, an intersection along the Garden’s visitor entrance was submerged under more than 30 inches of water—thereby necessitating our closure. The image below shows one of our service roads during normal water levels as it crosses a narrow point in our lake system. Compare that image to the video, taken at the peak of the floodwater inflow to the Garden, showing swift and powerful water flowing through this area. About three days after the heavy rains fell, the flood peak had passed, and the Garden was able to begin releasing lake water back into the Skokie River via a 10,000 gallon-per-minute pump near the south dam. Nine days later, all 100 million gallons of floodwater had been removed and our lake levels were back to normal. The images below illustrate the extent of the high water levels at the Garden. Remember, at their peak, the lake levels were more than 5.5 feet above normal. 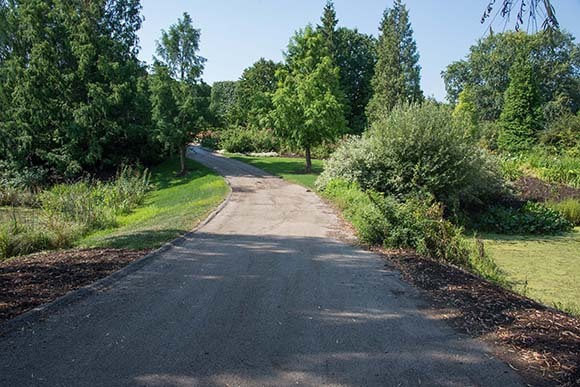 Because the Garden was intentionally designed from the very beginning to accept and temporarily store floodwater from the Skokie River, we’ve experienced few long-term impacts from the recent flood. None of our buildings took on any water. Most of the vegetation near the lakeshore that went underwater survived. There was some damage to plants in the Garden—a few inundation-sensitive shrubs and herbaceous plants, as well as some turf were affected (particularly along the water’s edge of the Malott Japanese Garden). Some were pruned and others may need to be replaced with more water-tolerant taxa. Importantly, more than 500,000 native shoreline plants that we’ve installed along the Garden’s lakeshore withstood being underwater for up to nine days without impact. These plants will continue their important “engineering function” to stabilize our fragile shoreline soils and keep the slopes from eroding into the lake. The recent heavy rainfall and flooding were of historic proportions and caused devastation to many communities in our region. Looking forward, residents can take steps to help lessen flooding: for example, installing a rain garden on your property can help reduce flooding, particularly for small- and modest-sized storm events; click here for more information. Regional solutions for stormwater management can be particularly beneficial for larger rainfall events. Countywide stormwater management agencies in our region work to implement flood control programs and help homeowners who have been affected by flooding. For more information about these agencies and the programs they offer, in Cook County, contact the Metropolitan Water Reclamation District; in Lake County, contact the Lake County Stormwater Management Commission. And so while the recent flooding may have left a bit of soil residue on some leaves of plants located nearest the lakeshore, rest assured that all is quite well here at the Garden. In fact, the frequent rains this summer have contributed to luxuriant growth and some amazing blooms, and we look forward to a continued explosion of color as summer progresses into fall.